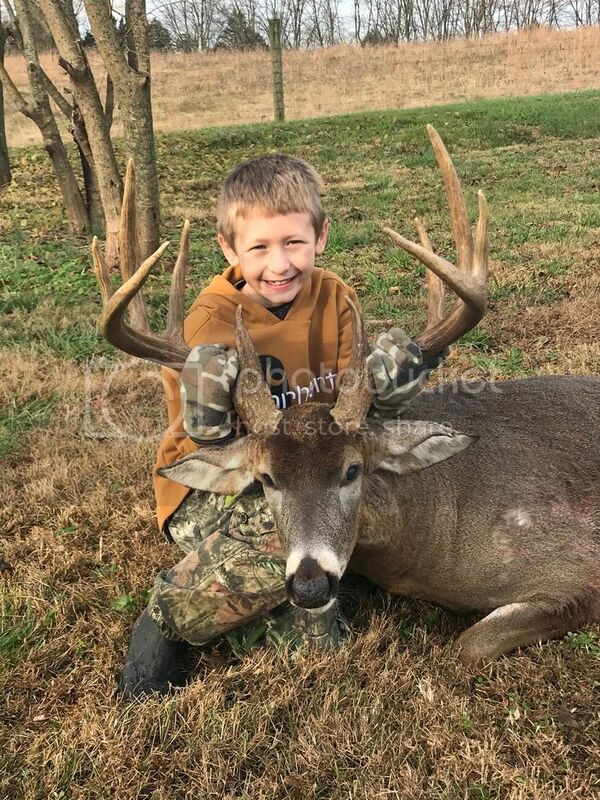 I am a proud great grandpa to post this picture of a ten point buck, scored 162, taken by my Great Grandson, Collier Sexton, day before yesterday. His dad, Josh, had him in the blind before first light, and this bruiser crossed about 70 yards out when it was barely light enough to see. Josh stopped him, and Collier stopped him for good. Collier won't be 9 years old until Dec. 2. WOW! That's an awesome buck for anyone to take. Taking a buck like that at 8 years old is going to be difficult, if not impossible to ever top. Collier's dad, Josh, has had him shoot once a week ever since his 8th birthday. For the past 6 months, he has been shooting 1" groups at 100 yards, and for the past two months, he has been shooting at life size deer targets. Also, he has been on bowhunting stands with his dad a lot, which I believe has taught him patience and got him used to watching deer. His little brother gets to start shooting in two more years. Teaching them at a young age is paying off. Watching these boys grow up is a trip! Must be something new about Photobucket. I don't blame you, Xnavyordie. When I made the post, the picture was there for all to see. Now it has that crap about 3rd party hosting. They didn't say anything about that before. Yup a few months ago photobucket made changes. You have to pay now to use them for 3rd party posting of images downloaded to their site. Crazy. Holy Smokes!......that latest pic works......and what a beast that young man took!